Do you need a heavy-duty compressor that can handle your high-demand compressed air applications? 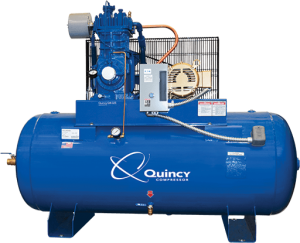 The Quincy QR-25™ is recognized throughout the industry as the leader, unmatched by any reciprocating compressor in the field and backed by one of the most comprehensive five-year warranties in the business. This highly advanced 1-25 hp air compressor series provides reliable, time-tested performance, a low cost of ownership and a maximum efficiency that will have a positive impact on your company’s bottom line for years to come. The QR-25 is pressure lubricated in all critical areas, runs at slower speeds and features durable cast iron construction for longer life and less downtime. View the legendary heritage of the QR-25 below. See also: QR-25 Climate Control. The QR-25 is pressure lubricated in all critical areas, runs at slower speeds and features durable cast iron construction for longer life and less downtime. Because the QR-25 operates at slower speeds, it’s capable of producing more CFM per horsepower. The QR-25 can also deliver up to 500 psig, making it suitable for the most challenging air compression tasks. The Quincy QR-25 also features a revolutionary disc valve design that enables it to operate efficiently at lower temperatures. The intake loaders are designed to reduce horsepower during low-demand applications, which helps to extend valve life. Loadless starting reduces much of the strain on the motor, which also lowers energy consumption — and costs. The positive displacement rotary oil pump provides sufficient lubrication to all vital compressor components, which ensures smooth operation and further reduces oil temperature. Maintenance of your QR-25 is a breeze, which contributes to the ease of operation and low cost of ownership. While most of the required maintenance involves the valve system, the valves are designed for easy accessibility – you won’t have to worry about dealing with cumbersome processes such as removing the cylinder head or unhooking the discharge line. The selection process for purchasing an air compressor should entail much more than looking at the purchase price: You should also consider how much it will cost to own and operate the compressor over time. Because the Quincy QR-25 produces more air per horsepower than other compressors on the market, you’ll notice a significant reduction in your energy costs which will save you a substantial amount of money. The QR-25’s built-in reliability also greatly reduces the possibility of compressor failure and costly downtime. The modern-day Quincy QR-25 traces its roots to the 1930s when it was introduced as a member of what was simply known as “the Quincy Line.” A portable QR-25 version was introduced during the 1950s and was used to provide heated compressed air to keep lenses clear on military equipment. The first four-cylinder QR-25 was unveiled during the 1960s and the Coast Guard began using the QR-25 as part of its tug boat starting procedures in the 1970s. The QR-25 commemorated its 75th anniversary in 2014, and this legendary air compressor keeps going strong. View the legendary heritage of the QR-25 below. See also: QR-25 Climate Control. 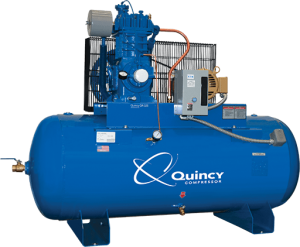 Contact us to learn more about the Quincy QR-25 or get in touch with the Quincy Compressor distributor in your area. Make sure your QR-25 runs well for a lifetime with proper reciprocating air compressor oil and maintenance.